The PV Market Alliance releases today its second annual Global PV Market Report. According to the PV Market Alliance (PVMA), global PV markets should grow by approx. 20% during the next two years, reaching at least 60 GW in 2016 and more than 70 GW in 2017 following its medium scenario. Although a significant level of uncertainty prevails, PVMA anticipates that market demand will remain bullish, mainly driven by a continued strong growth in China, India, the USA, and several emerging markets. In contrast, Japan will see its market slightly decreasing after the record 11GW last year. Similarly, in Europe, after a slight market increase in 2015 due to the temporary UK boom, the entire European market is expected to return to pre-2015 levels. 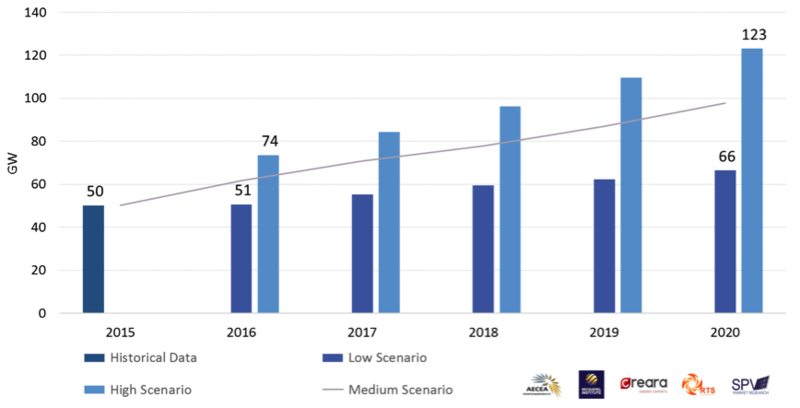 Long-term Outlook: Although subject to a significant level of uncertainty, the global PV market is likely to grow to around 100 GW of annual installations by 2020, and possibly even up to 123 GW in the most optimistic scenario. Combining an intimate knowledge of the market with thorough understanding of policy developments in both mature and emerging PV markets, the PVMA’s report constitutes one of the most reliable global PV market analyses available to date. Covering an in-depth regional perspective and detailed analysis of more than 40 individual PV markets, the report provides comprehensive insights allowing understanding and anticipating future PV global market developments. The “PV Market Alliance” was established in 2014 and groups well-known regional PV and CPV experts from China, Europe, Japan, Latin America and the US, covering the global PV market.